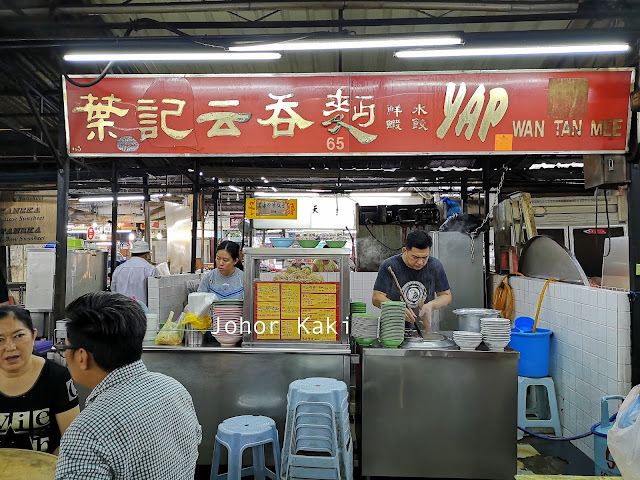 So, after durians right... we adjourned to the old Sri Tebrau Market & Hawker Centre 大马小贩中心 for one of my favourite wanton noodles at Yap Wan Tan Mee at stall #65. Oh.. man... I have not eaten Yap's wanton mee for 4 years and I must say this is the most improved wanton mee in JB. Yap Wan Tan Mee has gone from very good to one of the very best. 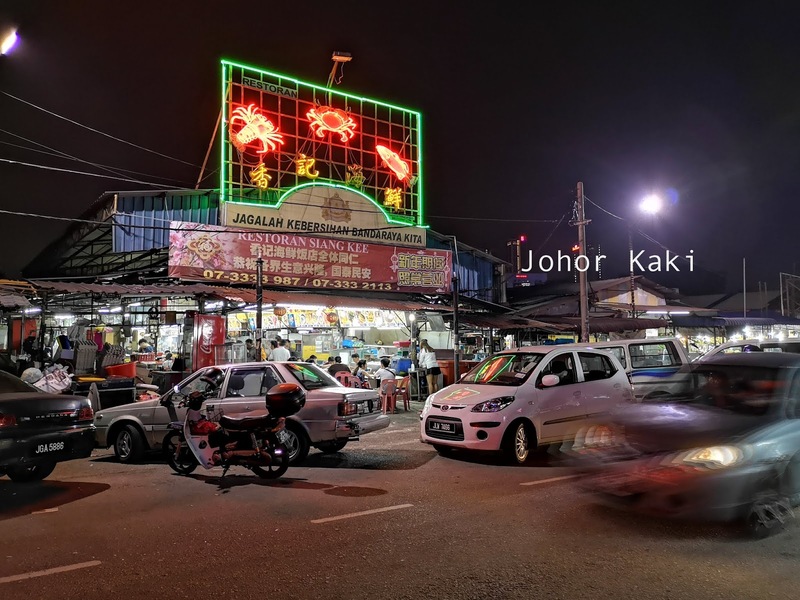 The 1980s vintage Sri Tebrau Market & Hawker Centre is old and rather tired but it is still a popular haunt for locals for food, drinks and chilling out with family and friends. 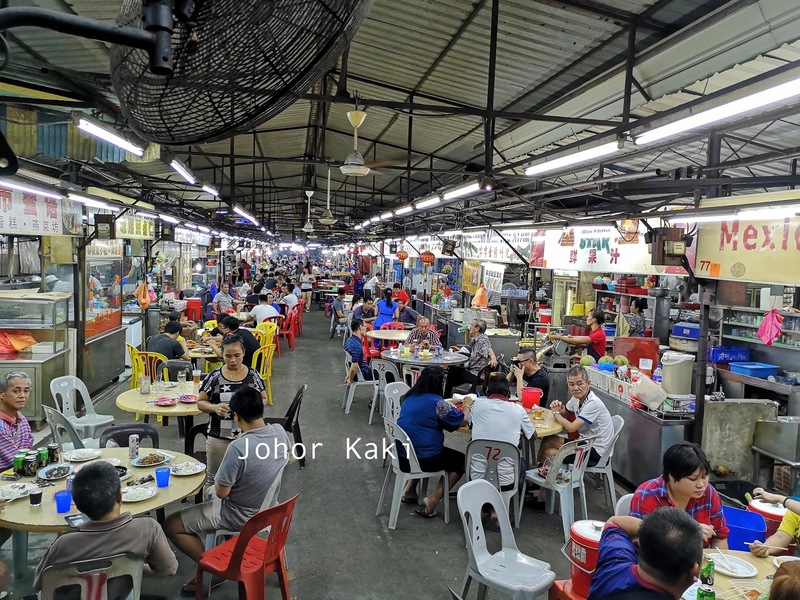 There are many old name JB hawker stalls here run by either the stall founders or their successors. Some, like Yap Wan Tan Mee, are hawker gems. 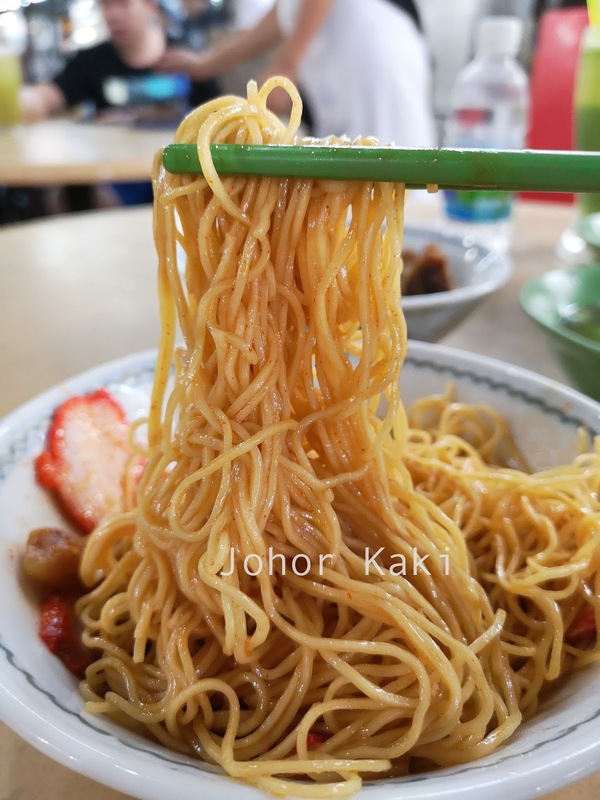 阿强 Ah Chiang has taken over Yap Wan Tan Mee from his parents for newly 10 years now. Ah Chiang was extremely busy on this Saturday evening, so I had no chance to speak with him. 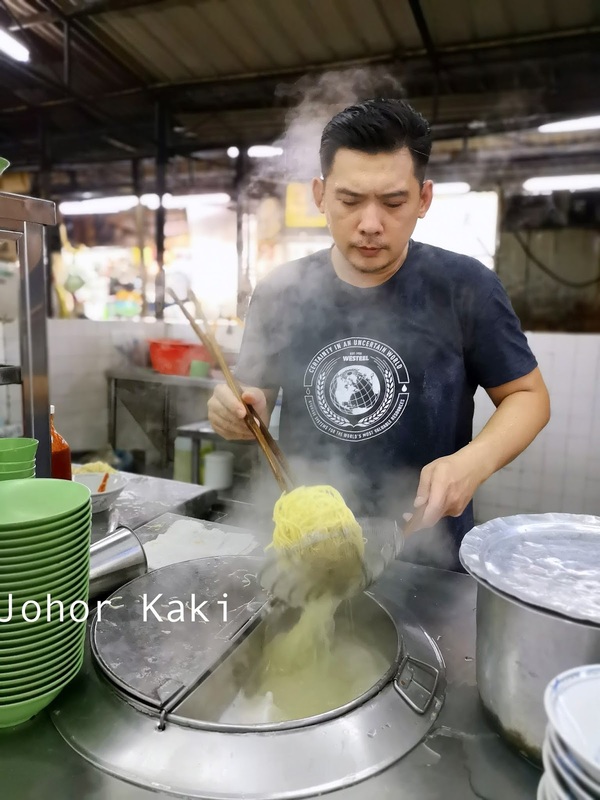 Full concentration is needed to ensure the egg noodles are done just right - JB folks are picky about their wantan mee and Ah Chiang has a lot of quiet pride for his food. 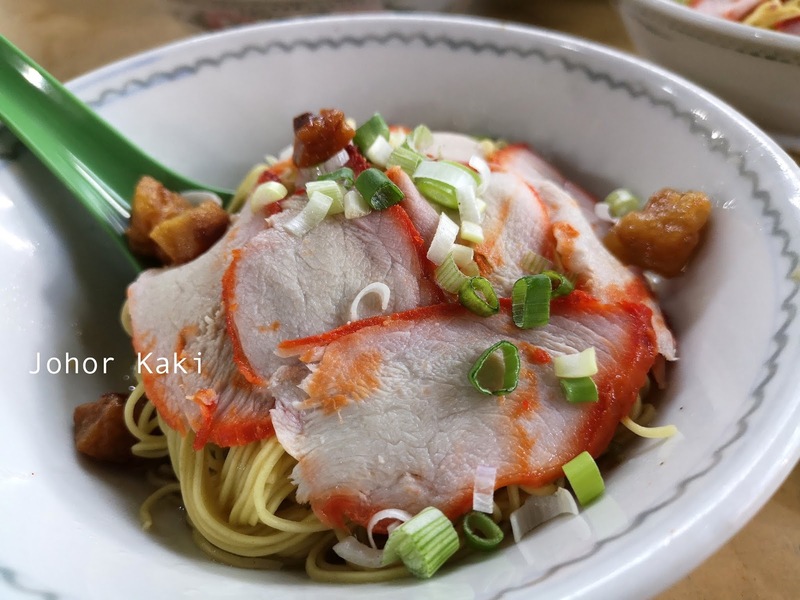 The first thing that caught my eye were the char siew slices which almost completely covered the noodles underneath it, so let's talk about them first. I didn't ask Ah Chiang what cut of pork this was but the thin slices of lean pork had enough visceral fat for it to be tenderly juicy and naturally sweet. 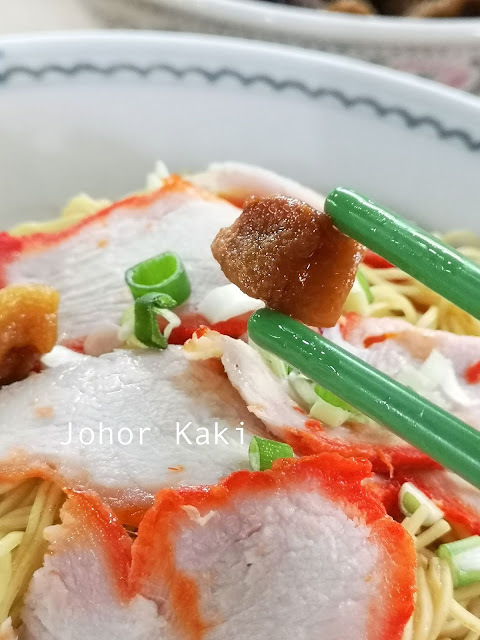 Not the marvellous roasted kind of char siew of KL wanton mee, but this JB style of char siew was tasty in it's own way. 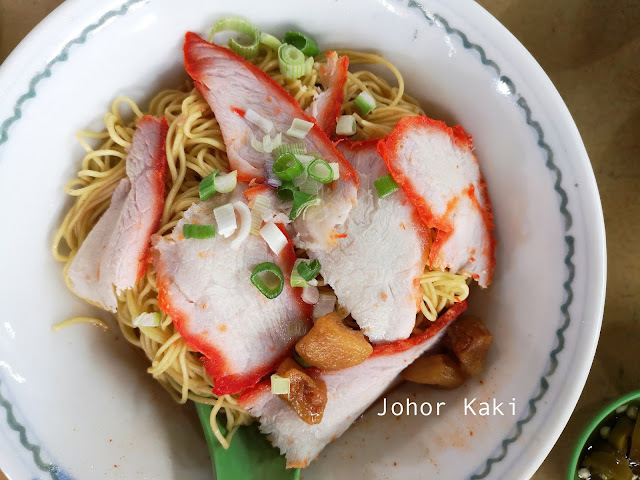 Indeed, JB style char siew does not compete with the wanton noodles for our attention. It complements the wanton noodles whereas, I often comment in jest that KL wanton mee is really an excuse to eat awesome char siew. Let's get back to the subject of wanton noodles, the queen in the bowl. 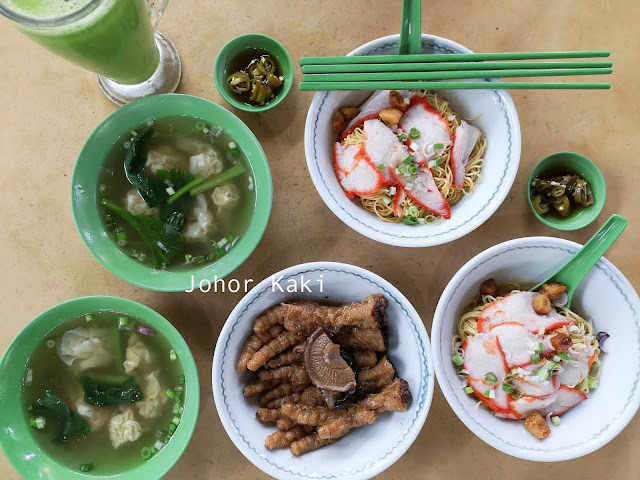 In Johor, eating wanton noodles is about the... noodles... duh. 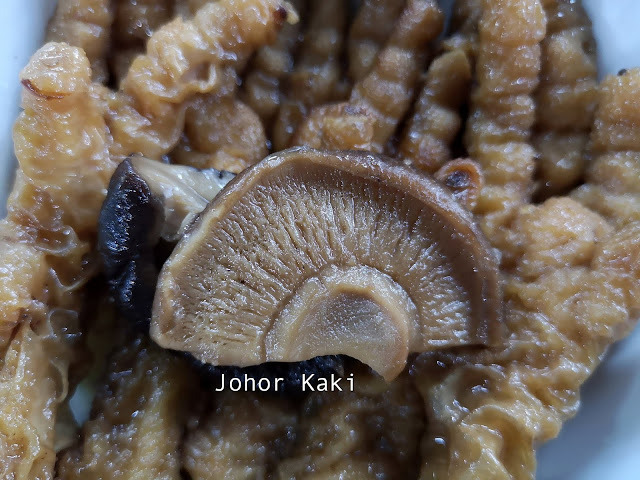 The noodles always have a house name - it can be Yap Kee (unrelated), Chin Chin, Ho Meng Kee, Ho Seng Kee, Yit Foh, Ah Piaw etc. Each house brand of egg noodles have their own distinctive mouth feel and taste, and their fiercely loyal fans. Every wanton mee hawker in JB either make their own noodles or get it from a reputable house brand. 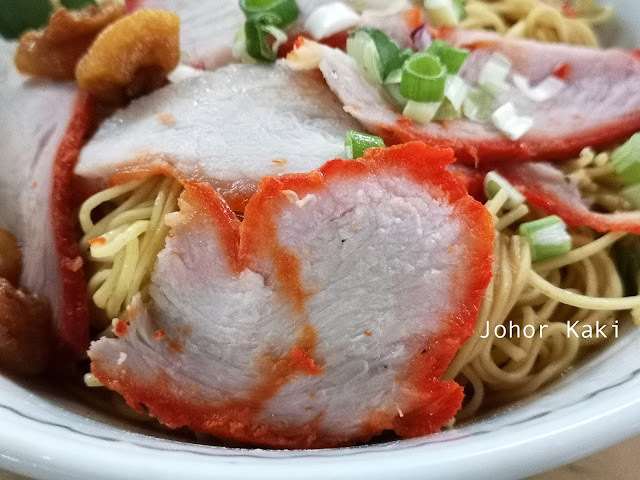 JB wanton mee lovers know the subtle but discernible difference in feel and taste between each of the house brands. Uniform generic wanton noodles won't cut it with JB folks. Yap Wan Tan Mee always makes their own noodles since Ah Chiang's parent's time. The eggy noodles have a certain weight in the mouth and have a nice tender spring to the bite. When broken with the bite, the noodles let off a subtle eggy taste and aroma. We had two types of sauces - one bowl with just lard and aromatic fried shallot oil (原味), and the other with a bit of chili sauce added for some zesty heat (小辣). The gentle mild intensity of the sauces accentuated the eggy taste of the noodles. Each wanton mee set comes with a small bowl of wanton dumplings. 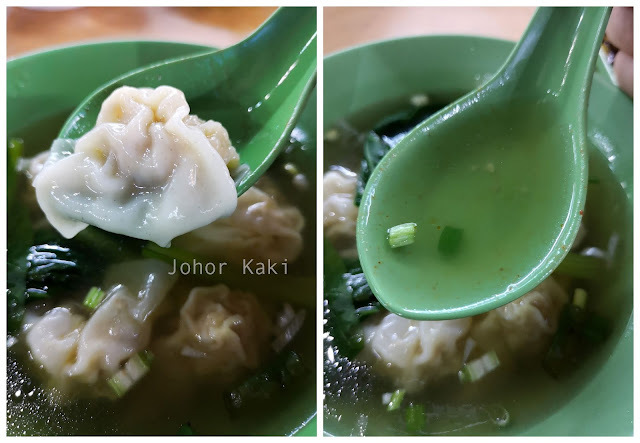 The simple clear savoury sweet soup was nice but the delight was in the wanton dumpling. 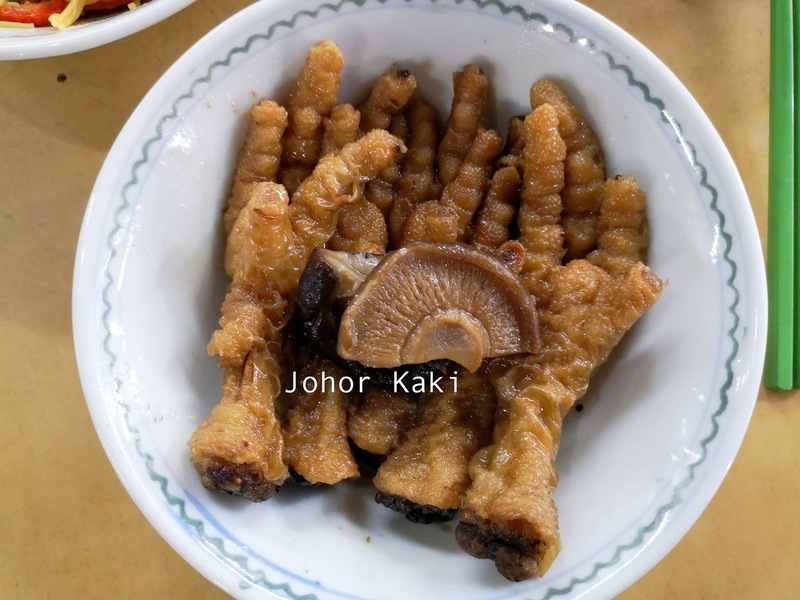 Yap Wan Tan Mee's braised chicken feet. The chicken feet were deep fried and then stewed in a savoury herbal stock till the skin and ligaments were reduced to wet soft wrinkles infused with savoury herbal flavours. The soft spongy mushroom absorbed savoury herbal flavours from the stock and gave its own earthy savoury taste to the stew. I like to eat my wantan mee with a big glass of zesty buah long long juice from the stall a couple of stalls away across the aisle from Yap Wan Tan Mee. 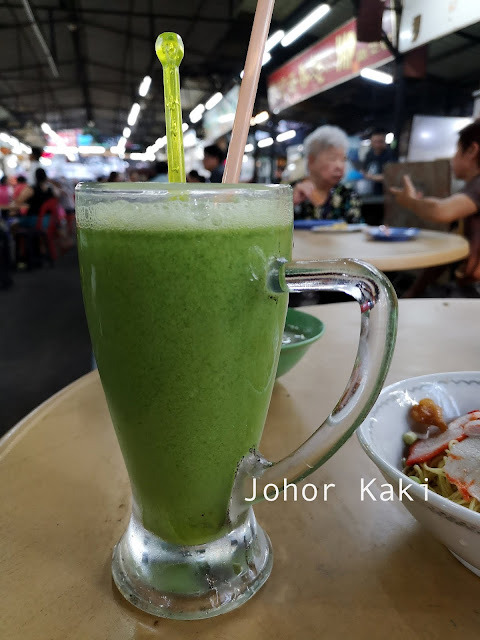 Pure buah long long juice with no ice added at RM5. 4-Star (out of 5). 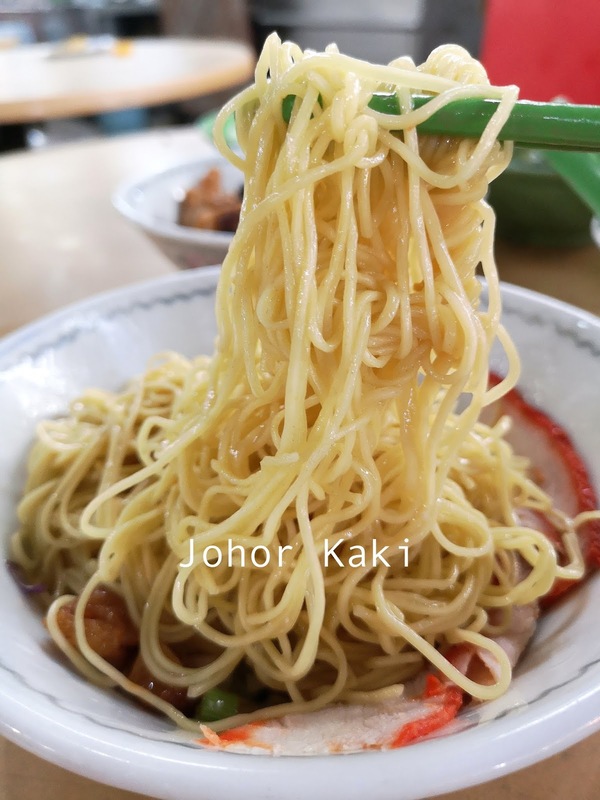 I am recommending Yap Wan Tan Mee at Sri Tebrau Hawker Centre for its eggy tenderly springy house made noodles which are well complemented by their tasty aromatic sauces. Great wantons with bits of tendon and delicious braised chicken feet. 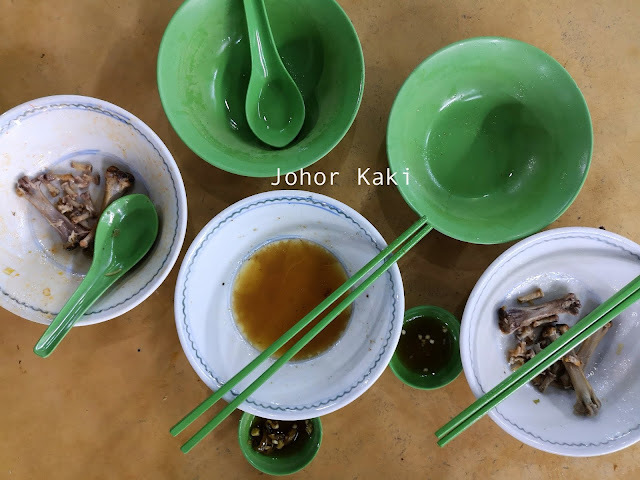 Enjoy it at an authentic local street food setting with table service at pocket friendly prices.